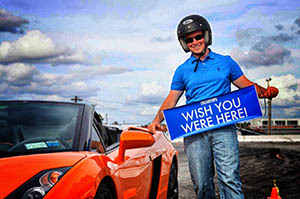 The Dream Car Sprint is Gotham Dream Cars' most affordable driving experience - a fast-paced autocross event that tests your skills behind the wheel of some of the world's greatest exotic sports cars. Free from the confines of speed limits and traffic, The Dream Car Sprint lets you drive your dream car the way it was meant to be driven. Our specially designed autocross courses are designed with fun and excitement in mind - enough twists and turns to keep you focused and enough open pavement to keep your heart racing at 8000 rpm. After a safety briefing and vehicle overview, a professional instructor will guide you through the course, after which you'll open it up for the thrill of a lifetime. And all of this awesomeness is available for just $249 ! "You'll be surprised at just how much fun you can have in the first three gears with a proper supercar...The instructors were very capable drivers and easy-going, the atmosphere was friendly and welcoming, and the cars, of course, were tremendous." "I got there to find two Ferraris, a Lamborghini, and a modified autocross course meant to show off the raw speed of these machines. As you would expect, it's really a thrill...The chance to drive a Ferrari at full throttle is worth the price of admission on its own." "I had a great time! 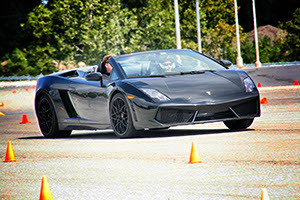 Everyone there was professional and fun, the cars were amazing, and everyone who came with - myself included - could not wipe the smiles off our faces after driving the Lamborghini!" "Just wanted to say I had a fantastic time at the Dream Car Sprint today. My instructor Will was an absolute professional and I ended my session with a huge smile on my face. The cars were ready on time, all the staff was professional and curteous, and I am looking forward to more events that you guys put on. Thanks again!" "I had a sensational time!! I am a teacher, so this is the closest I can get to enjoying these exotic sports cars and I am completely floored by the opportunity. I would recommend it to anyone who loves cars." We also consistently get great reviews on TripAdvisor, check them out here! What is the Dream Car Sprint? 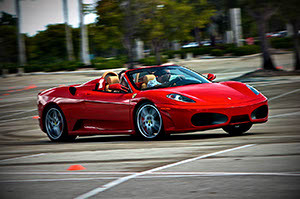 The Dream Car Sprint is an exotic car "autocross" driving experience. 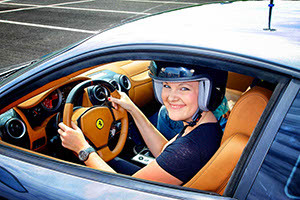 You'll have the opportunity to get behind the wheel of an actual, in-the-flesh exotic car and drive it for several laps around an autocross course. Wikipedia probably says it best: "Autocross is a form of motorsports that emphasizes safe competition and active participation...drivers navigate one at a time through a defined course...Autocross differs from road racing and oval racing in that generally there is only one car on the track, racing against the clock rather than other cars. As an entry-level motorsport it provides a stepping stone for drivers looking to move into other more competitive and possibly expensive forms of racing (such as rallying and circuit racing). Autocross courses are typically one to two kilometres long and tend to place demands on car handling and driver skill rather than on engine power and outright speed. Courses may be temporary and marked by traffic cones or be permanent tracks with approval by a motorsport body." Where exactly will I be driving? The Dream Car Sprint takes place on our own specially-designed autocross courses that we construct at various venues across the United States. For a current listing of available locations, dates, and time, please visit our reservations page. How long is the track? How long am I driving? 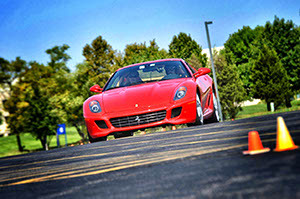 Our autocross courses vary but are generally just under a mile long. Between registration, vehicle selection, training, driving, and photo pick-up, you can expect to be at the event for approximately 1 hour. The actual driving time on the course will depend on your style and, like a roller coaster, takes 3 - 5 minutes to complete. Not at all. 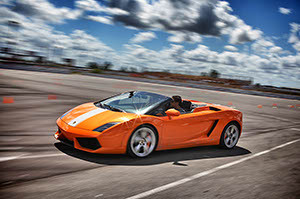 All of the vehicles used on the Dream Car Sprint are equipped with "tiptronic"-style semi-automatic transmissions ('F1' in the Ferraris and 'e-Gear' in the Lamborghinis), so you'll be able to drive like a pro no matter what. All drivers must 21 or older to participate in the Dream Car Sprint. Uh-oh -- I'm under 21! What now? Unfortunately all drivers must be 21 or older. Our insurance requirements have limited our ability to be flexible here. As a result, our ride along program is no longer available. But we welcome folks of all ages to join us at the event as spectators. Kids are welcome to sit in the cars and take pictures in and around them. Can a friend ride along with me (or can I ride along with a friend driving)? We're very sorry, but passengers are not permitted on the Dream Car Sprint. Our professional instructors sit in the passenger seat while you drive, and all of the vehicles used on the event are 2-seaters. Do I need any special type of insurance to participate? No special insurance is required. 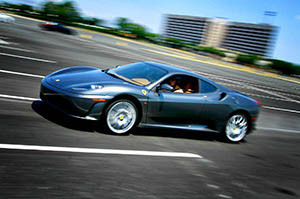 As with all Gotham Dream Cars vehicle rentals and experiences, you are required to have full coverage personal insurance (comprehensive, collision, and liability) on a personal vehicle in order to participate as a driver. Are there size/weight requirements to participate? I know sports cars can be tight. We do not have size restrictions for the Dream Car Sprint. 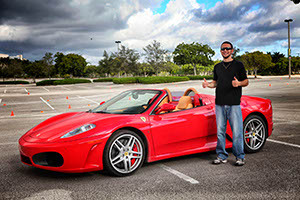 Adults of all sizes should have no issues getting behind the wheel - we've had professional athletes from all sports rent our cars (from football linebackers to basketball centers), so even those that are larger or taller than average can participate in our event. Unfortunately, we are unable to say with 100% certainty whether you'll be 100% comfortable until you get seated, but we wouldn't worry. How can I record my Dream Car Sprint experience? Gotham Dream Cars has a professional photographer on site to capture the experience, so you can rest assured knowing your Dream Car Sprint will be memorialized forever. Absolutely! You can purchase a gift certificate directly from our online store.